A Third of the Way Through: Time for a Little Introspection. We’re about a third of the way through the Olympic Games as of the end of today – and I’ve always found this to be a good point to look back through the images I’ve made so far, and to make adjustments on how I will shoot from here on out. This of course has put me in a very introspective mood. Truth be told I’m not thrilled with any of the images I’ve taken so far, and as a result my head has been in the clouds for most of the day. I’m trying to figure out how I can change my approach from this point on, in an effort to produce images that I will be proud of, and that hopefully this blog’s readers will appreciate throughout the rest of the games. Trying to figure out what to do next has led me to asking one of the most basic questions that most sports photographers ask themselves on a regular basis: How exactly do you define a great sports photograph? I can tell you that in the 17 years that I’ve shot news and sports in this business, the answer to that question has changed radically many times, often in relation to the type of organization I was working for and what they expected of me. I’d like to go into that for a little bit. Some of you may not have time, so please just go ahead and enjoy the photographs from today. For the others, please read on. First, one of the biggest factors that I should mention is how much of an impact technology has had on sports photography in the past decade. Autofocus has had more of an impact than perhaps any other specialty in the photography profession. When I started to shoot sports in 1993, I fell into it rather haphazardly, because I had a knack for manually focusing a 300mm or 400mm lens. I was a French kid who didn’t know what a first down was, but was able to get more sharp images than not. At the time, if you got more than 60% of your shots in focus, you were the exception to the rule–and you could count only a few dozen photographers in the country, who could get higher percentages then that on a regular basis. An amateur who picked up one of these lenses would often get less than 5-15% of their images in focus–if any at all. It was definitely an acquired skill. These day having 80%-90% of shots–if not close to 95% for the best sports photographers–is not uncommon. The technology has become that good, and therefore the playing field has been leveled, making it more difficult than perhaps ever for the top photographers to stand out. Therefore simply “getting” the shot (in focus and well framed) is no longer an accomplishment–you need to push yourself more than ever to find unique images that no one else is making. You can no longer stand out simply because you shoot with longer lenses (the longer they are, the exponentially harder they are to focus and the more likely it is you’ll crop an important element out because you have shot the image too tightly) or by having better timing than the next photographer. Doing things the old way simply won’t do. Which brings me back to my simple question: What makes a great sports photograph? As I’ve found out, a lot of the answer to that depends on your audience, or almost just as importantly, who you’re working for. 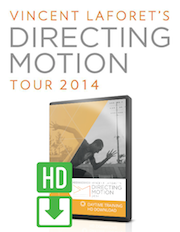 Different types of organizations consider different types of images to be the “pinnacle” of sports photographs. And very often your client and/or editor is the ultimate judge of how good of a job you’ve done. If they’re happy, you’re happy and hopefully they’ll hire you again and you can make a living in this very odd profession. That is a big factor of how we come to judge our success as photographers–it’s often more important than what contest one might win or what your peers think of your photography. When I worked at my first job at Agence France-Presse, I was given very specific guidelines as to what they (and most wire services still do) look for: shoot tight action photographs–of the play of the game or the athlete of the game–and almost more import than how good your photograph is how fast you can get it on the wire (all too often the first image on the wire–not necessarily the best one–is the one that gets published, and getting published is the ultimate goal.) If you get an amazing action photograph of a player who is not relevant to the story, don’t even both sending it in–it will never get onto the wire. 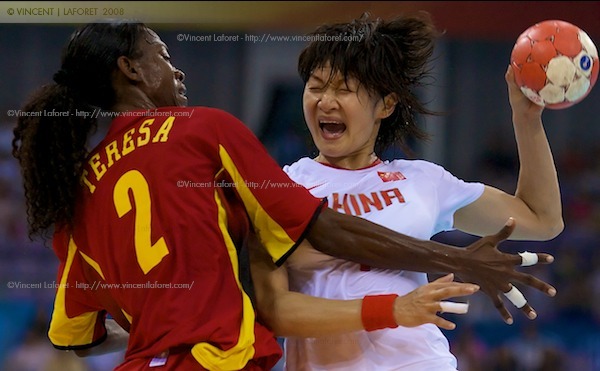 Xiao Mei Liu of China scores a goal as she is defended by #2 Eduardo Maria Teresa of Angola in the handball preliminaries. This was a radically different approach to sports photography than what I had been trained in by Agence France-Presse. In some ways you took a clinical approach to sports photography – you learned to look at the sport with an incredibly keen eye. You’d study just exactly how each athlete would move so that you could shoot them full frame with a very tight lens and not cut off any relevant parts of their anatomy. You’d learn every move in a gymnast’s routine, trying to find the perfect moment where you could frame just the gymnast’s head with the Olympic logo on the balance beam below–again full frame (cropping was not an option.) You would know exactly what direction Michael Phelps turns his head to breathe in during freestyle, or how far from the finish line he pops his head out from beneath the surface in the butterfly. You would go one or two days in advance to study a venue and to see how the light moved throughout it as the time of day changed and plan out your shooting schedule based on that movement. It was a very different approach to sports photography. If you had a shot of Tiger Woods jumping in the air as he won the Masters and there was someone wearing a distracting orange shirt in the background–the image would never have a chance. Again it would end up in the bin. The Allsport photographers were the “experts” at making the “perfect” sports image if you will. My next career move brought me to The New York Times–and there once again, I had a rude awakening during my first few months of shooting sports for them. I’d describe their style as somewhere in between Allsport and Agence France-Presse, with a heavy bias toward getting the “moment.” This isn’t that surprising given that the Times is often referred to as “the paper of record.” I would come back from baseball with images that were shot full frame and perfectly lit–a photograph of an outfielder perfectly outstretched missing a catch, say. And often the editors would say: oh, that play wasn’t really a deciding factor, we don’t need it, but did you get the image of Derek Jeter hitting the game-winning home run? My response would be: who in the world would want to see another photograph of yet another guy swinging a bat? Those photographs are a dime a dozen… and people surely the readers get tired of seeing them every day! Don’t they? But to the Times, their job was to report on the news, not just show pretty pictures. Your job there was clearly delineated: get the play of the game, a nice shot of the most valuable player–and if you can come back with these moments captured with a good amount of aesthetics, more often than not you were considered a star photographer. What your backgrounds looked like, how tightly you shot the image (and how much of a crop you later applied to the original) was completely irrelevant. If it was shot full frame and the background was more out of focus as a result, that was a nice bonus. You learned to shoot defensively–you learned to play the odds. You’d push the envelope, but only so far. If you decided to shoot with a 600mm instead of a much looser 300mm and cut off the player’s limb as a result, tough luck–the paper would without hesitation run a wire photo instead. But you also became an expert at playing those odds, and became very strong in making sure you were at the right place at the right time and to find angles that would maximize your ability to capture a variety of outcomes. So getting the perfect image was not as important as getting the moment of the game. Some photographers at the Times were able to do both on a regular basis however–Doug Mills and Chang Lee come to mind–both are covering the games together for the paper here in Beijing. The fact that they’re able to do both is a testament to their skill as sports photographers. It’s a very very tough thing to do day in an day out. Especially when you are keenly aware that The New York Times–and all newspapers and magazines out there–subscribe to all of the major wire services. If you didn’t get the moment, your entire day was shot, as they would never hesitate to use a wire service photograph instead. When I left the Times more than two years ago I started to shoot significantly fewer sports and started to shoot more commercial work and other types of assignments. This gave me a chance to take a step back from sports photography and to gain some form of perspective given that I wasn’t busy churning out sports photos on a daily basis. What I’ve found during that time is that sports photographs have become incredibly homogeneous, in large part to the technology that I mentioned above and given how easily disseminated they are through the Internet. 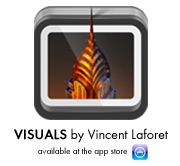 Every photographer can see what other photographers have shot just minutes ago on Yahoo! News–and try to either copy that image or work on making it better. As a result, a lot of the photography starts to look the same. It’s no longer just a handful of photographers making different images. Don’t forget that before digital and the Internet, film had to be processed and published. By the time you saw the image published, it was the next day and the event was over. It’s very rare for me to see a sports image that stops me in my tracks these days. A lot of this of course has to do with the fact that I’m slightly jaded. 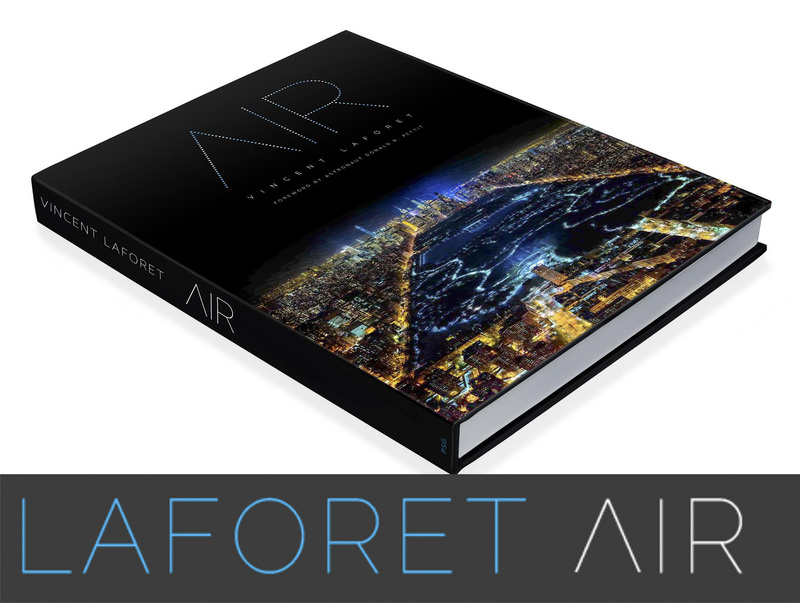 I’ve been surrounded by some of the best sports photographers throughout my career and witnessed them produce some of the most awe-inspiring photography in person, and I’ve seen how they accomplished those photographs and learned from them. Naturally, my definition of what makes a great sports photograph will be much different then that of the average person. That’s true of any professional in any field, of course: The standards become much higher the more you perfect your craft, and the more you are exposed to great work. You also become biased because you are aware of how difficult it is to pull of certain images, and this in turn means that you tend to look down a bit on the great photographs that might not be so difficult to pull off technically. That’s a very dangerous path to fall into. To be honest, there is very little photography that I see out there today that I find very impressive. Even in the nation’s top sports magazines and by the sports photographers, I can count the photographers that I am regularly impressed by on one or two hands: Donald Miralle being one of them (Donald is one of the three photographers photographing these Olympics for Newsweek and also contributing to this series of blogs.) These few photographers routinely come back with images than none of the other photographers do–images that no one else even sees. 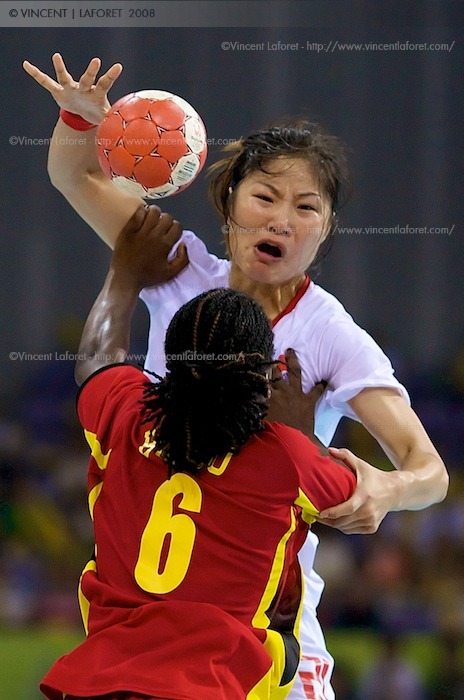 Bing Li is defended by #6 Bombo Madalena Calandula of Angola in the handball preliminaries. Mike Powell (also one of the three of us shooting and blogging for NEWSWEEK) and I are doing a lot more commercial work these days and have distanced ourselves a bit from shooting in the “standard” sports style that is very prevalent today in editorial photography. “Tight is Right” is one way to describe that standard–and that’s what Mike was referring to when he said he had returned to his “long lens repertoire” in a previous post. Our clients are looking for images that have a bit more of a setting or sense of place and as a result we are often looking for images with much more atmosphere or shot from a different angle. Last year I shot an entire series of sports image with tilt-shift lenses (you can see them on my site)–trying to find a different approach to sports photography. One of the big frustrations for me (and I’m guessing for Mike as well) is that there is so much clutter at the Olympics–so many television cameras, security guards, and empty seats in the backgrounds of your photographs–so making these more atmospheric can prove to be very difficult. here. There are no rules, and Simon Barnett (the NEWSWEEK director of photography, a.k.a. El Jeffe) has given us complete freedom as to what type of images we shoot. Some might be of the defining moment of the Olympics, or the gold medal winner–but images of the last place finisher or some team you’ve never heard of are also welcome, as long as the image stands on its own merits. It’s a new place for me–frankly, it’s a dream job. Basically just go out there and make pictures without the fear of your editor calling you at the end of the day asking you for “this play” or “that athlete” because that’s the news of the day or the lead of the article they’re working on. And in many ways such freedom can be a little crippling. Which is of course quite ironic. Another factor of course is writing for the blog: with each day it gets tougher and tougher to come up with new things to write about. After all, not every sport is humorous, not every day brings forth new interesting anecdotes. Often you deal with the same logistics issues and headaches day after day. Some days you have amazing images–and on others you’d just as soon not publish anything. In these past two days of photographing gymnastics, for example, I’ve been swaying back and forth between trying to make the perfect (beautiful) gymnastics photograph, versus getting the shot of the fall that may have cost the U.S. the gold medal. I’ve never had the liberty in my 17-year-career to decide purely for myself just what it is that I want shoot (with the exception of personal work.) As for the blog, we edit the image that we make out here ourselves–no one is looking over our shoulders. It’s an incredible level of freedom that few photographers have. We have no editors to answer to, or stories to shoot for. As long as we keep the readers (you) interested, we’re accomplishing our jobs (I think.) The Internet is opening up news avenues and taking us to new territories, and we are now shooting for a new audience with more freedom than ever. 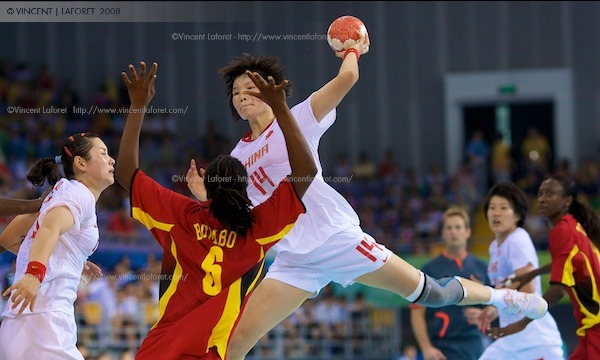 Xiao Mei Liu of China scores a goal as she is defended by #6 Bombo Madalena Calandula of Angola in the handball preliminaries. Yet having such freedom leads you to ask yourself, what it is that you consider to be the ultimate photograph–is it the news of the day? Is it the slow start off of the blocks that cost the relay team the gold? Or the most beautiful photograph of the day that may be completely irrelevant in grand scheme of sports history? (Ultimately, of course, getting all of the above in one frame is the goal–but that happens once an Olympics if you’re lucky.) Are you shooting for yourself or to inform the reader? Is there a difference between the two–and what does the reader (as opposed to your publication or editor) want to see? Finding that answer has proven much more difficult for me to answer than I ever would have thought… especially given this new role as a blogging photographer. But that’s what I’ll be attempting to do over the remaining two-thirds of these games. In case you haven’t figured it out by now, the reason that I haven’t been thrilled with any of the photographs that I’ve made so far is that I’ve found that I somehow returned to these old ways of shooting. It’s almost as if through I have been hardwired or programmed to do so over the years and it’s proven much tougher to shake off than I had anticipated. All of the endless rules and craziness that is involved in photographing a chaotic event such as the Olympics has thrown me right back into these old habits. Today marks the day that I come to terms with that, and hopefully let go and move on to making what I consider great photographs–if I’m lucky. So much of this ultimately involves a lot of luck. As always, your comments and feedback are more than welcome–you after all are the ultimate audience that we’re working our butts off for. So let us know what you think. Or, you can just follow along as I try to work through these questions via photographs over the next 11 days. I read your full article in Newsweek blog. I’ve to say this is one of the most honest text I’ve read about photography. Kudos. Thanks for sharing your open thoughts. Vincent, keep up the good work. I really appreciate you sharing your top photos with us, as well as letting us into your head as you shoot one of the most exciting events of this decade. When I found out that you had begun blogging, I was thrilled. After seeing your work at the Eddie Adams Workshop, I knew you were just on a different level than most of the photographers out there. Reading this blog has further confirmed that. I think this is one direction that the photojournalism industry is heading. Sure every Joe and Mary can get a photo of the big news event with their P&S or their cameraphone, but can they tell a story, and continually keep people coming back for more quality photography? I think that’s where our role as photojournalists will shift. Less than just providing a photo and more towards passing on the experience. But then again, what does a 3rd year college student know about the industry? I’m not sure if you remember me, but I was at the Eddie Adams Workshop 2 years ago, and told you that I wanted to be a neurosurgeon. I’ve continued to shoot for our school newspaper, and have been the photo editor there for 3 semesters. Moving into the new year, I have been struggling a lot with your same thoughts. Being the editor at a small school newspaper, I’m pretty much in control of what goes in the paper visually. I’m the main shooter, so I go to most of the events. So what goes in the paper mostly comes down to what I think is a good photo. But going into my 3rd year, I’m starting to try to find something fresh to show the readers. Most of my sports photos (or anything, in fact) have started to meld together. Besides the faces in the photos, they all look the same. I can remember thinking to myself, “I stood here last year shooting this same event.” And going through the photos later, the same shots appear. So this year is going to be a struggle to find those new angles or those different shots no one has seen before. I’d just like so say thanks for sharing your thoughts and your perspectives, and being completely vulnerable. And while we may beat ourselves up for not getting “the shot” or not being fresh enough, I think we sometimes need to step back a second and realize how lucky we are. While some people are stuck in a cubicle all day drudging through life, we are out shooting and doing something we thoroughly enjoy. Not everyone is as fortunate as we are. Great photos, and keep up the fantastic work. Can’t wait to read your next post. Your related article on Newsweek is one of the most insightful posts on sports photography that I have read in a very long time. I appreciate the time you took to write despite your insane schedule. Also glad to see your 135 survived the fall. 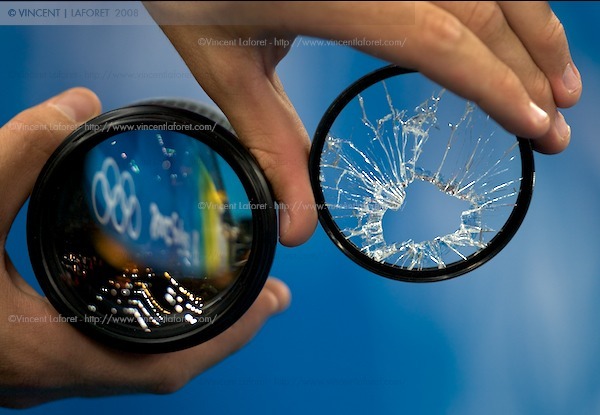 It would be sad to see such a sharp and fast lens out of commission. Wow. Thanks for such a candid view into your thinking at this point in the games. In a way, I can relate in the struggle to find ones vision. In another, of course, I can’t even begin to relate because of the scale and magnitude of the games. I’ve been looking forward to every post from Bejing and now I can’t wait to see what comes next. Wow. Your work is amazing. I blogged your mad skills. This should be compulsory reading for any person aspiring to shoot sports. Needless to say, (in my opinion at least) this is one of the best contributions I have had the opportunity to read. Many thanks for sharing your knowledge! Thank you for sharing your honest thoughts. I eagerly await to read your post every day and each time I have been rewarded with great shots and lucid writing, but this one is your best yet. As a simple reader and viewer of photographs, I can tell you that the shots I like most are those that show the emotion of the athletes. The joy of the winner, of course, but also the sadness, the effort, the nervousness, the fear, the frustration, the relief. Show me the person behind those finely tuned muscles, show me the years of training, the sacrifice and the pride. Many thanks again for your great work! 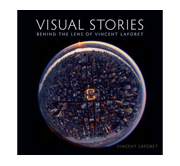 Great work and nice writing Vincent. Sorry this is repetitive. I gotta throw this one out, though … The Olympics is a mark in history for an athlete and a generation of fans. If we consider sports popular because it is the land of heroes, there is an interest to cement in time the emotional moment that tells a story. The arena is offering minimal opportunities for perfect light. There are challenging access options for different angles. Freeze in time the microsecond of drama for a dream to be built upon. Those seeking too hard for angles or chimping do well for the set designers in a 360-degree view, but years of training will explode in each event often in a face, but also in body english. Find a new gear and I look forward to the inevitable goods. You are such a great photo journalist! We enjoy reading your blogs. Keep up the great work!!! Vincent – Trust your instincts. It’s your intelligent perspective that we appreciate and want to see more of. Keep it up. I’ve read every word and look at every image of each day’s post. Sounds like you have too much going through your head right now. Doesn’t always sound like your enjoying it. You know what to do. Enjoy it! I’ve been enjoying your images so far! Pondering your conundrum, it occurs to me that events split two ways. Some events revolve around a decisive moment which overshadows all that has come before and since. Much as I love to see a well composed, brilliantly lit, perfectly timed photo, I love to see that moment too. Other events may be less so dependent on any moment: A thrashing at basketball, a solid lead built steadily at cycling. I guess in those cases, looking for the best shot, not the less-important moment is the way to roll. Since you’re one of the few photographers who will discuss technique while you’re on the job shooting, I wonder if you could explain to photo enthusiasts what master photographers mean when they say that there’s a difference between what the photographer sees and what the camera sees, and that a good photographer must learn to know what the camera sees. Thanks for those stunning images. Thank you for opening a window to your mind. It’s quite the view. A person necessarily assist to make seriously posts I’d state. This is the first time I frequented your website page and thus far? I amazed with the research you made to create this particular post incredible. Great activity!